“I got this!” I’ve said this many times in confidence and in stubbornness. Yes, you may “have it”, but it certainly doesn’t mean that you won’t need or benefit from support on your journey to get to your next level. I’ve made the mistake of not reaching out and trying for too long on my own to accomplish something only to realize I could have completed a goal much sooner or experienced so much more had I asked for help. It’s easy to just want everything done (like, yesterday!) and try to scatter efforts to grow every area of your business at once. That’s when overwhelm can set in and it’s easy to lose focus or give up. Instead, you need access to tools and resources to improve your business in a way that doesn’t feel overwhelming. Tackling something specific when you need it can mean quick, significant improvements and results. Being exposed to new strategies and tools can trigger new ideas and increase revenue. Many of you have shared with me how you can’t live without your go-to people, advisers, or tribe. Support from your peeps can come in many different forms- it’s about having access to what you need instead of feeling alone and uncertain. 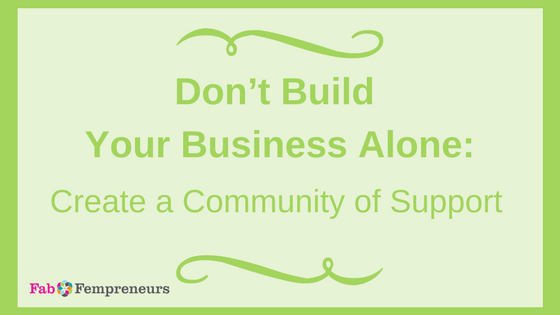 Having a go-to community where you can ask for feedback, resources, and have others act as a sounding board is like a superpower for your business. With honest and positive support, your ideas will more fully develop and your progress will be much faster as you work toward your goals. Understands your business well enough to offer key questions, feedback, and ideas. Can hold space for you to be where you are, while pushing you forward- they are at the right level in business and personal maturity. Trustworthy and forthright- they’re going to keep things confidential AND they’ll tell you the truth, not just what you want to hear. Without these necessary ingredients, you can end up feeling UNsupported, spinning your wheels, or worse. Choose your Hub wisely. Having an awesome go-to group of fabulous people and cool downloads isn’t all you need. You also need some sort of accountability to act. Knowing you’re going to report to someone else on your progress to commitments provides an undeniable push to get-it-done. Leverage the power of commitment if you’re serious about growing and getting to your next level. An ideal scenario is one that offers multiple levels of accountability that supports your personality, your lifestyle, and your business goals. You may not get these features from one single community…or you might. I’m beyond the moon to be launching our next Fab Fempreneurs Signature Business Building program Group on June 5th (it’s coming up quick!) which will include all three features I’ve outlined above (and LOTS more!). Schedule your FREE CALL with me today to see if this is exactly what you need t get moving forward and on to your next level.